Good anytime and perfect location for walks as we are right on the rail trail! Two nights stay at the award-winning Jackson House Bed and Breakfast Two full hot breakfasts each morning Two Jackson House wine glasses and a visit to our wine cellar Two jackson House Bike/Hike water bottles Treats and toy for your pet Package Price: Bordello Room - $279 / Cottage Suite - $379 How to Book: Call 717-227-2022 Additional Notes: Must book one of the two pet-friendly rooms based on availability and must bring a crate for your pet if you intend to leave him/her in your room while you go out. 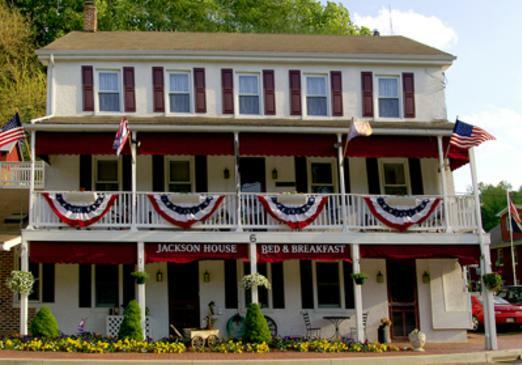 Classic 1859 bed & breakfast on rail trail, private baths, hot tub, gardens, wine cellar, fireplace and hot hearty breakfast.